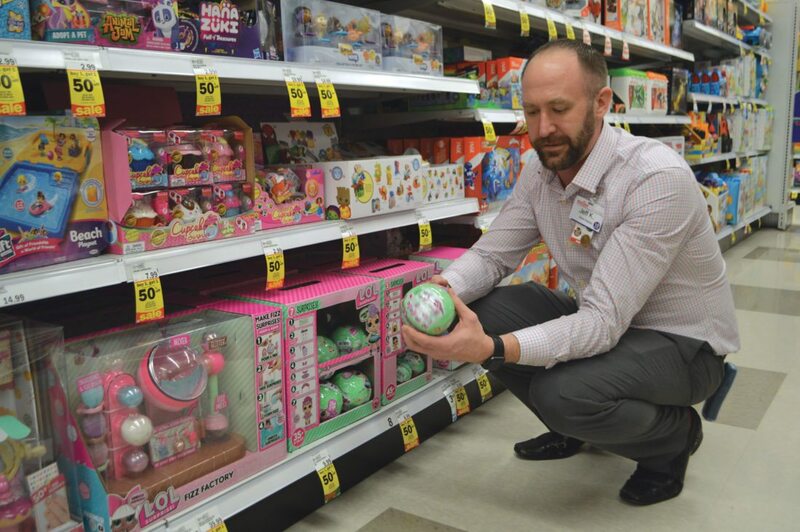 Haley Gustafson | Daily Press Escanaba Meijer Store Manager, Jeff Kietzman, shows what is arguably one of the hottest toys of the season, “L.O.L. Surprise Tots Dolls” at the store Tuesday. According to Kietzman, the dolls are one of the hardest things to keep on Meijer’s shelves. ESCANABA — With Christmas right around the corner, kids are putting together their wish lists and hoping for some of the hottest toys of the 2017 holiday shopping season that seem to be flying off the shelves at local stores both big and small. One popular toy the Escanaba Meijer store can’t keep on its shelves are L.O.L. Surprise Tots Dolls. “Those are very hard to keep in stock,” said Store Manager Jeff Kietzman. The dolls, which feature “seven layers of surprise,” allow kids to unwrap each layer unveiling a new clue or surprise, explained Kietzman. L.O.L Surprise includes a secret message that reveals a hint at the doll’s personality, a collectible sticker sheet, water bottle charm, shoes, outfit, accessories, and then the doll itself. Along with dolls, the series includes collecting pets as well, noted Kietzman. Following last year’s trend, “Hatchimals” have made a return as one of the hotter toys of the holiday, noted Kietzman. “Hatchimals” are a robotic toy that are able to “hatch” from an egg. Last season, one animal was included in the Hatchimal, but this year, people can buy Hatchimal twins which features two creatures to come from one egg. The interactive robotic tiger responds or “roars” to whoever is playing with him and responds to touch if a person pets him. “Roarin Tyler” also comes with a friend, a squeaky chicken toy, to whom he responds to as well. Kietzman explained other popular toys that are based off of the children’s TV show “Paw Patrol,” also seem to be leaving the store faster than they can arrive. The Paw Patrol Sea Patroller, which transforms from a ship to land vehicle, is one of the more popular items, said Kietzman. As well as transforming and surprise toys, Kietzman said anything dealing with the mystical creature, the unicorn, are also very popular. “Anything with a unicorn this year is huge,” said Kietzman. In addition to newly introduced toys, Kietzman said old family favorites such as Lego building blocks and Barbie dolls are also still top sellers. On the smaller retail end, Positively! The Center for Success, located in downtown Escanaba, has also seen an increase in sales for some items in the store. According to owner Peggy O’Connell, anything dealing with the “906” or the Upper Peninsula is very hot this holiday season. For the fourth year in a row, O’Connell said she can’t keep enough of the game called “Flickin’ Chickens” in her storefront. The game, which allows players to fling a rubber chicken at a target, is fun for all ages said O’Connell. At O’Connell’s other storefront, SignUp, popular items include people ordering license plates and Christmas tree ornaments with their pets on them. “We are doing photos like you wouldn’t believe of people’s pets,” said O’Connell. From the start of the shopping season from Thanksgiving Day through Cyber Monday, more than 174 million Americans shopped in stores and online beating the estimated 164 million as estimated by the National Retail Federation’s previous survey. On average, consumers spent $335.47, with $250.78 — 75 percent — specifically going toward gifts over the five-day period. The biggest spenders were older Millennials (25-34 years old) at $419.52, said NRF.